Here we are again, some more pictures from the Hohr–Grenzhausen trip. You can tell that I am capable of doing virtually nothing here at the moment by the fact that all these posts are from the trip. It does mean however that you are probably going to get the whole trip, you poor poor people, when usually I end up missing things to tell you because I’ve gotten carried away by something new and exciting that’s happening right now. 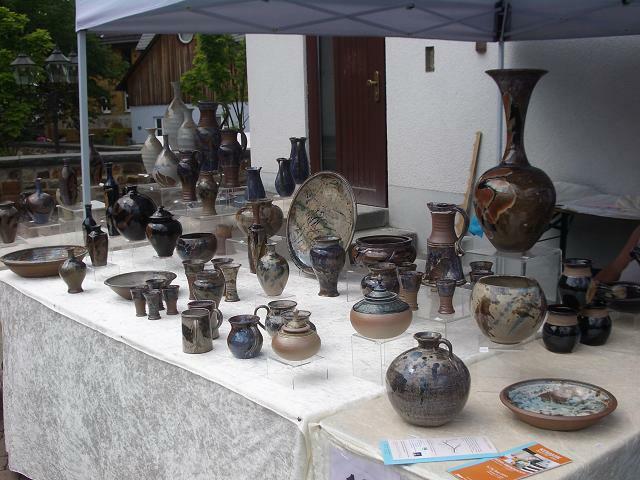 So today’s pictures are all stands from our little group, well all except the first picture of the raku fired coffee and the last picture which was the entry for the “spot the British potter in Hohr–Grenzhausen visiting friends” competition. 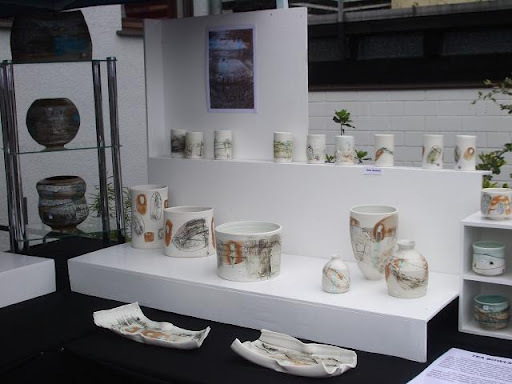 So the stall above belongs to Andrew and Michael aka the Northumbrian Craft Pottery, they’ve been working together for 23 years now making good, honest pots. 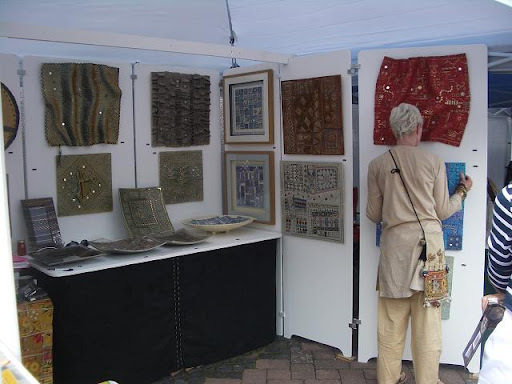 Here’s Pollie on her and Garry’s stand, most of the work they had with them was wall pieces, they are having a new website put together at the moment so call back and see their link in a few weeks to see it. 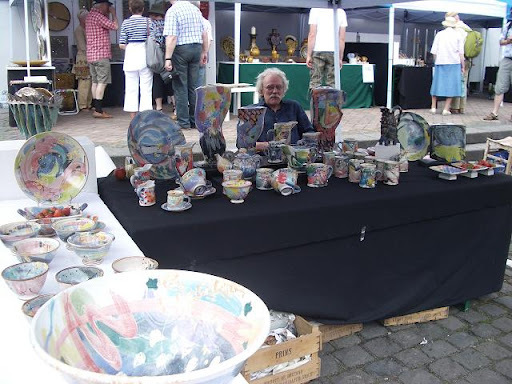 Here’s David Constantine White with his vibrant majolica, he’s a font of knowledge on the traditional pots of the Yorkshire area, and even though he’s from the wrong side of the hills I do like the chap. 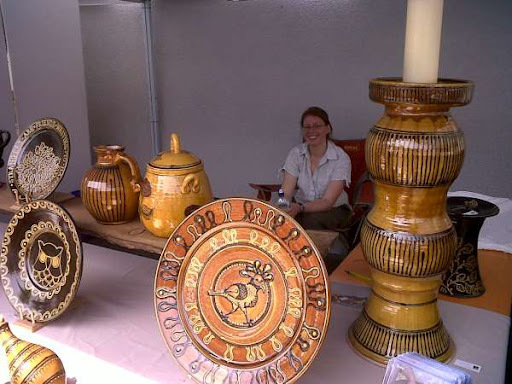 Here we have Chris Cox’s stand, she is doing some soda fired pots now and if you get the chance to visit Earth and Fire next weekend you can she her exhibiting there. Oops that’s me and my stand. 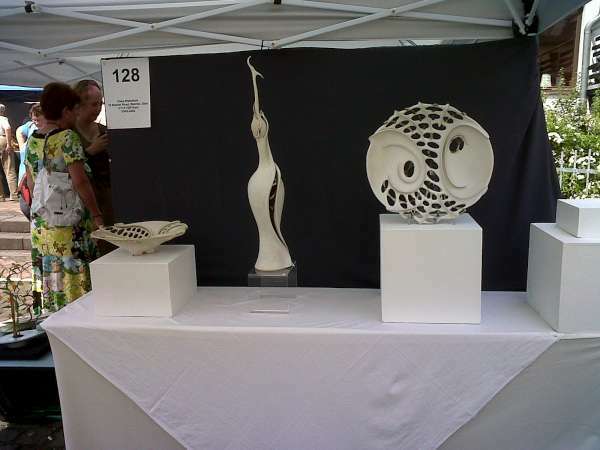 This is just a part of Clare Wakefield’s stand, the white against the black is very eye catching. Clare will be at Potfest in the Park with me at the end of July. I didn’t get any closer pictures I’m afraid, you’ll have to visit her website and have a look to see them properly, another one with a new site up coming any moment now. 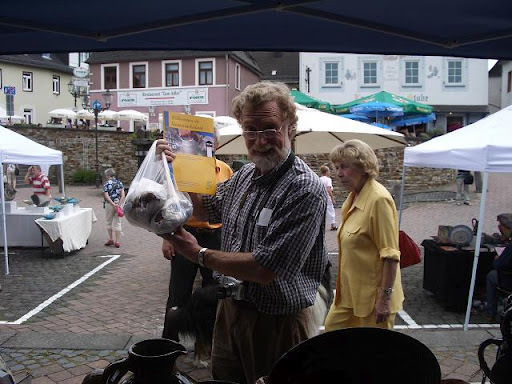 Geoff Cox, again a rubbish picture, I’m sorry about that, Geoff along with his wife Chris organise the hugely successful Potfest shows each year. I do like the thought on the home page of Geoff’s website, something to think about. Name that potter in one, the picture is a bit dark, sorry, I was sheltering from the intense sun outside, he’s carrying a bag of tasty freshly baked bread and appears to have shed his characteristic bow tie in the heat. Lovely chap and full to bursting with wonderful stories and anecdotes. Now I realise as I get to the end here that I don’t have a picture of Tim Huckstepp and his stand, sorry Tim, if anyone sends me one I shall put it up for you. 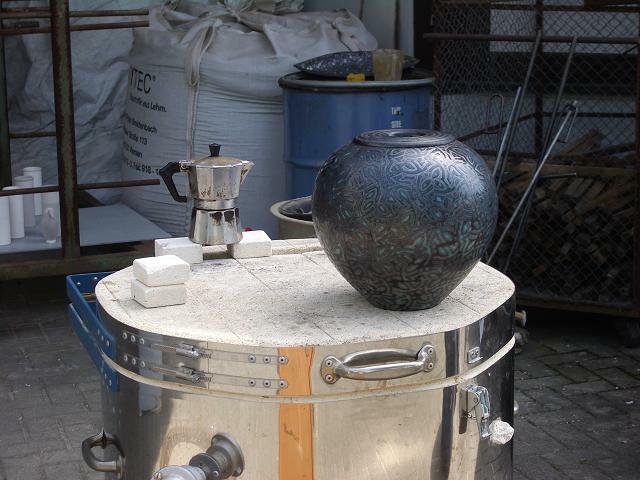 This entry was posted in Chris Cox, Clare Wakefield, David Constantine White, Garry and Pollie Uttley, Geoff Cox, Germany, Hohr-Grenzhausen, Northumbrian Craft Pottery, Tim Huckstepp, Toff Milway. Bookmark the permalink. Not given it away to me–though I thought I might figure it out from the 'labels' list–but don't recogize any of the names!On the Goef thought–I had a Dutch friend that talked about the "red thread" that runs through our lives as in a tapestry–not always visible but there still throughout. I've reached the stage of my life where I want to find that red thread and trache it back through all those years that make my life. Nice memory you plucked for me.